In an earlier post we looked at how to combine elearning with an on-the-job mentoring program. I received a lot of questions about the learning journal. So in today’s post we’ll look at the basic structure of the learning journal and how you could use something like it to complement your elearning courses. Connects elearning to real world activities. The learning journal is used as a bridge between the learning that happens in the elearning course and what happens in the real work environment. Elearning courses let you compress a lot of the instruction and content which can save time during the training. It also has the benefit of complementing both the learner’s schedule and that of the peer coach. Guides the learner’s progress. By including a calendar of activities and objectives, the journal acts as a map for the learning process. It sets expectations for the training program with specific activities. It also ensures consistency. Captures key learning points. Often during the training time (especially with elearning courses) we only get one shot at the information. For the learner the journal can be used as a personal work manual that contains key information, personal notes, and other resources relevant to the job, even after the initial training period. In essence, it becomes a job manual. Tracks completion of training. For the organization, the journal acts as a record for the training program. I usually include a formal record of completion that can be forwarded to the manager or human resources department if needed. Chunks. The training program is broken into chunks or modules. The goal is to keep it flexible and manageable. You don’t want big long modules. Each module combines some elearning with hands-on instruction. Notes. 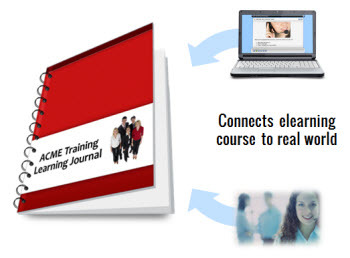 The learner uses the journal to follow along with the elearning course. It can be used to take notes and jot down quick questions to ask later during the time with the peer coach. Review. Inside the journal you can ask some review questions. In addition, the peer coach has review questions to pose after the elearning is complete. This helps her assess the learner’s level of understanding prior to doing some hands-on activities. It’s a great way to find and fill gaps in understanding. Practice. The peer coach facilitates the hands-on instruction or practice activities that correspond with the elearning module. Use a calendar or schedule to list the practice activities. Track. Upon completion of the training, the learner runs through a self-assessment. It can be as simple as a detailed task list that the learner can review and mark off when completed. This can serve as an informal training record. Or you can insert a formal training record in the learning journal that is completed and forwarded to whoever it is that tracks training. There are a number of ways to design a learning journal that bridges the course content with the real world activities. Here are a few of the main sections you can include. Explain the overall training objectives and expectations. Detail how the program works with the peer coaching, practice activities, and learning journal. Let them know that the learning journal is their personal training manual that they can always reference later if they need more help. Determine how long the formal training should last. Then calendar the activities. For example, you have a two-week program with five modules. Each module consists of an elearning course and some real-world practice activities. You want to map out a series of tasks over the two-week period. This establishes an agenda and the expectations for the time in training. Create a note-taking section that corresponds with the elearning module. I like to add visual clues where it makes sense. For example, if I show parts of a machine, I’ll include that in the learning journal or give them an activity where they label the parts of the machine on the paper. I also like to include a few fill in the blank sections for critical information. The main point here is to create a note-taking section for them to use with the elearning modules. I try to capture the critical information and the type of stuff they may need to reference on the floor when they’re away from the elearning course. How you create the elearning modules and learning journal is up to you. Try to stay lean and as engaging as you can. The elearning module doesn’t have to include every piece of information because you have the learning journal and other resources to complement it. At the end of key learning points, add a few review questions. I also include a review at the end of the module. This isn’t a stump the learner activity or a graded review. They should be questions that pertain to the essential objectives of the module and what they’ll need to know when they’re on the floor. These can also be used to facilitate some ongoing discussion with the peer coach. Part of the training program is training peer coaches. For them it’s a great way to develop some supervisory skills. We train them on the program; how to give feedback and how to assess the new learner. You can create a peer coach guide to go with the learning journal. I usually just have a peer coach section in the learning journal that triggers some dialogue between the peer coach and the new learner. At this point the peer coach wants to get a feel for what the person has learned from the modules and their level of understanding before doing some real activities. It’s a good idea to do schedule some debrief activities with the peer coaches because they’ll help you build the best training program. They can share where people are getting stuck and some of the best practices they have. In addition, all training programs have some sense of bureaucracy. Working with the peer coaches is a great way to get rid of it. Create a list of all tasks that the new learner should be able to perform at the end of the training. Be specific. Stating that they meet safety requirements is vague. But stating that they know how to put on the safety gear and activate the alarm in case of an emergency is more specific. The learner can review the list and mark off those tasks that he feels confident in. If he has questions about tasks or needs some remedial assistance you’ll know what to focus on. The checklist is also a good guide for the peer coach. She can pull some random tasks and have the learner demonstrate that he can complete them. 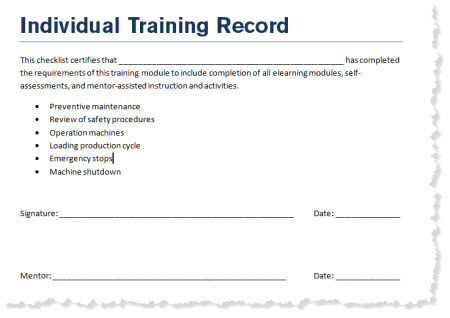 You can use the checklist as a proof of training or create a formal training record. When I create the training record I’ll list all of the tasks for that module and then have the learner and peer coach sign it. This gets forwarded to the appropriate department. Since this learning journal acts as their personal training manual, I like to include additional resources—things like important contacts, sites on the intranet, or any other information they may need. This way they have a quick, single-source reference if they need help after the training is complete. Pulling some training off the floor and into an elearning module ensures consistency and can compress the time to train. Having a peer coach assigned to a new learner helps in the training process and creates a social connection at work. Using a learning journal is an effective way to bridge the two. I’d love to hear your thoughts. Feel free to share them by clicking on the comments link. I like the combination of suggestions with detailed examples. Am I right that the journal is often hardcopy? Your machinery diagram reminds me of manufacturing settings I’ve experienced, where the learner would not ordinary have access to a computer–certainly not for on-the-fly reference. 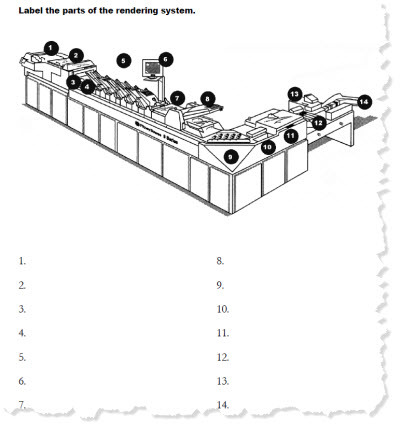 It’s easy to picture one or more print documents (“How the Packaging Line Works” from the overview, “How to Set Up the Thermoformer” as one of the in-depth lessons). Not to go too far afield; I’m just looking for suggestions or examples on what’s worked well for learners back on the job. Thank you so much for this, Tom! I’ve set up training manuals like this for clients, but they’ve always focused on real-world activities and interactions on either side of the e-learning, with just “yes-I-took-the-elearning” checkboxes. The idea of expanding the value of the e-learning by highlighting and using its content even more in a journal like this is great. I can use your ideas right away. So what’s your approach for getting the Learning Journal to the participants? Do you include it as an attachment in the elearning or do you house it elsewhere and include a link? We’ve actually launched a similar program to a learning journal. Instead of ‘chunks’ we call them “ELearning Episodes.” The topic is Safety compliance and as most would agree, safety is more of an awareness program than a ‘one-and-done’ eLearning course/module. The advantage carrying each episode across monthly releases over the course of the year. Each month focuses on a different safety hazard in the workplace. Instead of a journal, learners track their progress via a map with the destination being accepted into the Safety League. The whole thing is wrapped with an adventure story. Each month begins with the previous cliffhanger from the month before. Next phase is to add a collaborative ‘forum’ for taking notes and/or sharing their adventure. Good stuff here. Picked up some tips I hadn’t thought of before. Thank you! As a K12 online educator, I believe in giving my students time away from the computer. Some kids just need to ‘doodle’ rather than click. I appreciate the detail you provided and hope to adapt them for my course. Can you supply an e learning journal template we could use? What feedback have you received about actual usage? So many times training puts effort into producing/publishing resources only to learn that a high percentage get filed or tossed. Regarding your learning journal; I am wondering if anyone is using Microsoft OneNote for this purpose. Seems it could be configured using Windows Live/SkyDrive and be accessed by both the participant and the mentor on a real time basis. The meentee could post completed assignments and the mentor could comment on them. It would efectively be a progress/grade book. Great information as always Tom! Thanks! I too have to ask – would you mind doing another post to show us newbies an eLearning template? This is such a great idea with so many possibilities. I agree with miksa that some students have to really have a hands on doodling in their journal. That is the way i learn rather than book to mind. I have to have it go from sight to hand to mind. Thanks for sharing the details on the learning journal, Tom. I really strongly beleive in this kind of resource to compliment e-learning; I created a similar workbook type tool for a series of professional certification test prep courses I created last year. I feel like it serves the needs of people who tend to be kinesthetic learners (or nerdy note-takers like myself!) and need a way to connect the audio-visuals of an e-learning course with their way of synthesizing information. I’m curious as Dave was – it is a hard copy document, correct? For instance something that the course participant can download and print from the resources tab in the Articulate player? I have already done something similar for my learners that is make them create a learning blog. I allow but not force them to make that public for all other learners in the same course, so it could also encourage other to see typical obstacles and how problems in learning something were solved. Additionally I encourage all learners to post answers to exercises in a forum that all others may also read and comment. This is especially helpful if there is no such thing as the one right solution but when there are many good alternatives or – especially – when the transfer to every learner’s practice differs. Competency based training requires a portfolio of evidence to be maintained which is often a challenge. Because of the auditing requirements for Australian qualifications it is important these portfolios and journals are kept in an accessible spot. I imagine it is similar everywhere and especially for workplace compliance training. I use a combination of content developed with Articulate and host it in Efront LMS that comes with a journal(standard in the free, Open Source version). As everything is contained within a LMS,it is very simple to track progress. I am not sure about other LMSs but surely some would have this feature. The information you provided is fabulous for those who have an e-journal within a LMS but aren’t really sure how to leverage its functionality. It’s an important step to make these connections with the real world faced by the learners. All too often there seems to be an assumption that an e-learning course is the whole solution when it is only intended to be part of a multi-pronged approach. The e-learning side can provide consistency of message while allowing for local learning that may be varied according to the needs of the work group. A well designed e-learning approach can enhance the effectiveness of the time spent by team leaders conducting complementary on-the-job training. Thanks to Tom for sharing. One element I’m working on including in our courses is a learning log of sorts- a personal action plan- that the user adds to during the course. I created a 5 page fillable pdf form that ideally (first course is still in development)users save to their desktop and then add to it as they go along. I add it as an attachment. First off- great idea Tom, I just love this. I think the question of mobility comes up here. By offering this workbook in many formats (PDF for the users to print or take notes in, as a Kindle book for the users to jot notes in) we can help people access the workbook in their preferred way. I loved that idea and it’s so easy to replicate. I am in the process of creating a course where I provide time for reflection, an important part of learning. I’ve been using my ipad a lot more, especially iAnnotate where pdf files can be downloaded and annotated (extensively). This would be very useful for students or employees to download the pdf, accessed from the web, and mark up and turn in (email or upload). Thanks Tom for offering more ideas to the journal than I had. Very useful. I love this. I will apply for the New members Training in a Specific function field! Nice thing. I liked it. Few questions..
Why not learning notes are recycled, reused with an objective to enrich the learning process? Why not the learners are given the challenge of creating an economic value by recycling, and reusing their own learning Journals ? I echo Danny’s sentiments. Australian compliance requirements in some states require journal / log books of all learning activities undertaken – whether class based, one-on-one, on-job, etc for accredited courses. These need to be regularly discussed with their assigned trainer – even for online delivery. Our auditors tend to love ‘live’ documents and in particular those with handwriting. Of course many people, myself included, find handwriting tedious. So an option of having a structured online journal with fields would be great for someone like me. Alternatively, a writable PDF or word doc (or even excel spreadsheet) could meet the needs of learners with different preferences – those who prefer to ‘doodle’and those who prefer. One way to get around this and to help students stay on track for longer courses would be to get the student to upload the journal / logbook periodically so that it is stored in the LMS. This could easily be incorporated into the student activities calendar that you refer to. Those who doodle would need access to a scanner or they might type up their notes for uploading (and this will also be some learner’s preference too). In regards to note sections, I’ve often created workbooks / learning aids which students can download to enter notes as they work through their eLearn modules. There’s not necessarily a need for them to upload these later on. It just helps reduce the passivity of many eLearn courses.